Use this Jumbo Kauai 12" and 8" Destinations Laser Cut as a page layout or to add on as an embellishment to your page. This laser cut is cut out on a 12x12 Cardstock. 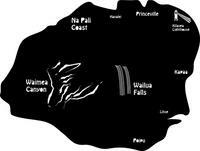 Destinations include Na Pali Coast, Hanalei, Princeville, Kapaa, Lihue, Poipu, Waimea, Waimea Canyon, and Wailua Falls.